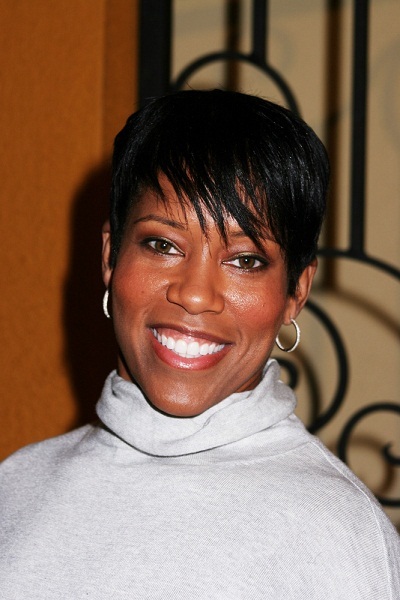 Regina King is an American actress and television director. She won the Academy Award for Best Supporting Actress for If Beale Street Could Talk (2018). Regina is the daughter of Gloria (Cain) and Thomas King. She is the sister of actress Reina King. They both have first names that mean “Queen,” Regina’s in Latin and Reina’s in Spanish. She has a son with her former husband Ian Alexander. Regina’s paternal grandfather was Thomas King, Sr. (the son of James Fletcher King and Callie Hardin). Thomas was born in Tennessee. James was the son of John King and Laura Logan. Callie was the daughter of Bath Hardin and Lucy A. Rilley. Regina’s paternal grandmother was Ruby Mae “Little Mama” Brown (the daughter of Henry V. Brown and Allene Moore). Ruby was born in Tennessee. Henry was the son of Abraham Brown and Virginia Adams. Allene was the daughter of Billie Sutton or Moore and Teresa Moore or Sutton. Regina’s maternal grandfather was Willie/Will A. Cain (the son of Allie/Ollie Cain and Alice Crosby). Willie was born in Alabama. Regina’s great-grandfather Allie was the son of Henry Cain and Mary/Mollie Austin. Regina’s great-grandmother Alice was born in Wetumpka, Elmore, Alabama, the daughter of Mose/Moses Crosby and Mary Meadow/Meadows/Meddows. Regina’s great-great-grandfather Mose Crosby was a member of the Freedmen’s Bureau, which helped freedmen during Reconstruction. Regina’s maternal grandmother was Beria Loretta Smith (the daughter of Janie Bell Hooks). Beria was born in Alabama. Janie was the daughter of Laurence/Lawrence Hooks and Lou Ann/Anna/Bell Caine. is it allowed to call her extremely good looking ?